Imagine this review unfolding in slo-mo to the rising strains of Vangelis’s electronic score, with Union Jacks fluttering in the breeze and plenty of ancient Oxbridge brickwork coming into view – and you’ve got some idea of the package that made this 1981 British film so friendly to Academy voters and audiences worldwide. Thirty years after it won four Oscars, ‘Chariots of Fire’ has been revived, but its vital signs are more sluggish than ever. Some of the ingredients are there for a strong sports movie: two runners from different backgrounds, each defined by difficult relationships with their faiths, prepare to compete for Britain at the 1924 Paris Olympics. Eric Liddell (Ian Charleson) is a Scottish Christian sprinter with a hotline to God, a disdain for the establishment and a sister who would prefer they go on a mission to China, while Harold Abrahams (Ben Cross) is a Jewish Cambridge student who experiences racism from the mouths of everyone from the porter (Richard Griffiths) to a college head (John Gielgud). There are scenes that grab – Abrahams’s dash round Trinity quad; the chats between Gielgud and Lindsay Anderson as dons who dress up prejudice in fine words. But the parallel stories tend to cancel out, rather than complement, each other. Oddly, for a film about triumph over adversity, there’s nothing as uplifting as the opening and closing jogs along a windswept beach. Brilliant. Was a privilege to get to see this in the cinema as I was only little at the time of its original release. What a mean-spiritied and vacuous review. 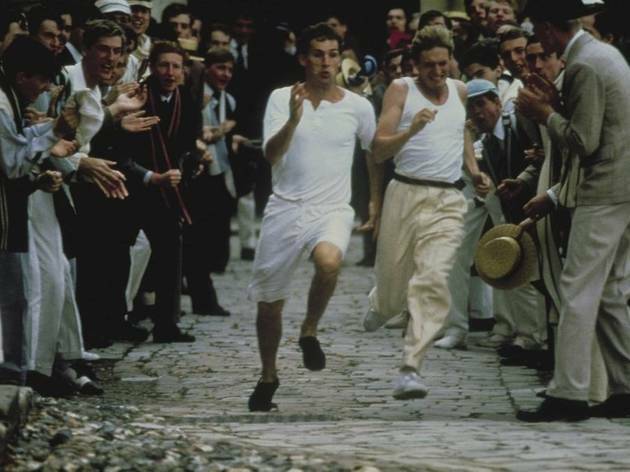 Chariots of Fire remains an iconic British film and it's re-release prior to the 2012 games is a welcome relief from the usual dross available at the cinema today. A ture story of real people stuggling against the odds, wonderful character acting, superb photography and musical score make for an enthralling two hours. It is clear that our reviewer paid much more attention in the humanities than mathematics at school. Even the clue about the initial release date being 1981 in the title to the review is missed. It won the Oscars 30 not 20 years ago. Please Time Out proof read reviews before publishing them! True measured against many modern films the stories pace is slow but to understand the characters you need the deep background story. Like The Artist showed there is an audience for well made, well written and well acted films. Put together a superb score, an excellent screenplay and a superbly filmed and shot film and you get a film classic. One for all those who appreciate well made films. for my money, this is the best move or all time!